Hyderabad: Bolstered by the pink sweep that fetched six of the seven Assembly segments which are part of Nalgonda Parliamentary constituency, the ruling TRS is going all out to take advantage of the fast-growing dominance on the electorate to wrest the seat. Held for as many as six times, Nalgonda is equally prestigious for Congress and may go all out to defend. For Communists, it is their last bastion, but with a fast-eroding support base and apparently beyond the scope of revival at least, for now, thanks to the deep inroads made by the ruling party. The Nalgonda Lok Sabha constituency comprising seven Assembly segments — Nalgonda, Nagarjunasagar, Devarkonda, Miryalaguda, Huzurnagar, Suryapet and Kodad has an electorate of 15,79, 207. Created in 1952, it was won by the Communists in as many as seven elections (six times by the CPI and one time by the CPI-M). The constituency was held by the Congress for six terms, TDP for two terms and Telangana Praja Samiti for one term in the past. The economy of the constituency was predominantly an agrarian one. Whatever industrial growth it witnessed over the past four decades was limited by and large to the Hyderabad – Vijayawada national high way corridor. A major part of the constituency, thanks to its overdependence on groundwater to meet both the irrigation and drinking water needs, had for long been facing fluoride problem. It had been an election issue for the Communists as well as other opposition parties for decades in the past. Fight for safe drinking water to the fluoride-hit population in Nalgonda spearheaded by water rights activist, Duschrala Satyanarayana’s in 90s grabbed national attention forcing the governments to initiate short term measures such as setting up de-fluoridation plants, besides taking up a number of projects intended to meet the drinking water needs by with surface water drawn from Krishna. Mission Bhagiratha, Telangana Water Grid project launched by the TRS government is intended to providing tapped water supply to every household, is being looked upon a boon for the people in not only Nalgonda parliamentary constituency, but rest of the fluoride affected pockets in the State. The constituency had a population of 20,43,419 and 76.24 per cent of it is rural while 23.74 per cent are living in the towns. The Muslim minorities constitute a sizeable segment of it while the Scheduled Castes and Scheduled Tribes constitute 17.55 per cent and 15.36 per cent of the population respectively. In 2004 general elections, the CPI national secretary General Suravaram Sudkahar Reddy won Nalgonda parliamentary constituency by defeating BJP’s Indrasena Reddy with a margin of 56,151 votes. The CPI could garner a vote share of 45.55 per cent as against 40.40 per cent by BJP. Thereafter, the CPI had experienced a downtrend in its electoral prospects. In 2009 general elections, Gutha Sukhender Reddy, who was in the fray as the Congress nominee defeated Suravaram Sudhakar Reddy (CPI) by a margin of 1,50, 275 votes. The Congress and CPI had a vote share of 45.78 per cent and 31.6 per cent respectively in the polls. In 2014, Gutta Sukhender Reddy won the seat once again as the Congress nominee defeating TDP’s T Chinnam Reddy by a margin of 1,93,156 votes. Palla Rajeswar Reddy, TRS nominee who was in the fray, has a vote share of 21.92 per cent as against 39.69 per cent by the Gutta Sukhender Reddy (Cong) and 23. 45 per cent of the TDP nominee. Gutta Sukhender Reddy, shifted his loyalties to the ruling TRS making Congress look out for a new candidate for the constituency to fight the seventeenth Lok Sabha elections. The TRS is the major gainers in the Nalgonda LS constituency in the assembly elections in December 2018. 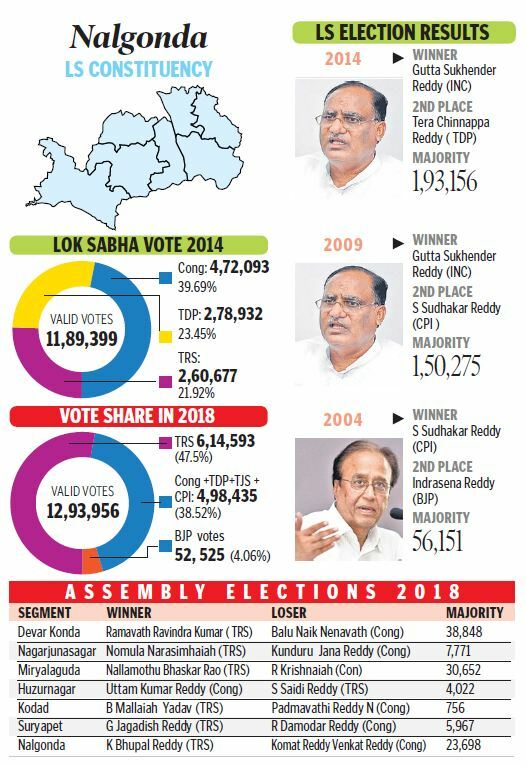 The party nominees emerged victories in six of the seven Assembly constituencies — Deverkonda (ST), Nagarjunasagar, Miryalaguda, Kodad, Suryapet and Nalgonda with huge margins. The only seat garnered by the Congress was Huzurnagar with a slender margin of 756 votes. On the whole, TRS had a vote share of 47.5 % as against 38.52 managed by Cong + TDP+ TJS and CPI in the parliamentary constituency (as per the outcome of Dec 2018 Assembly polls).